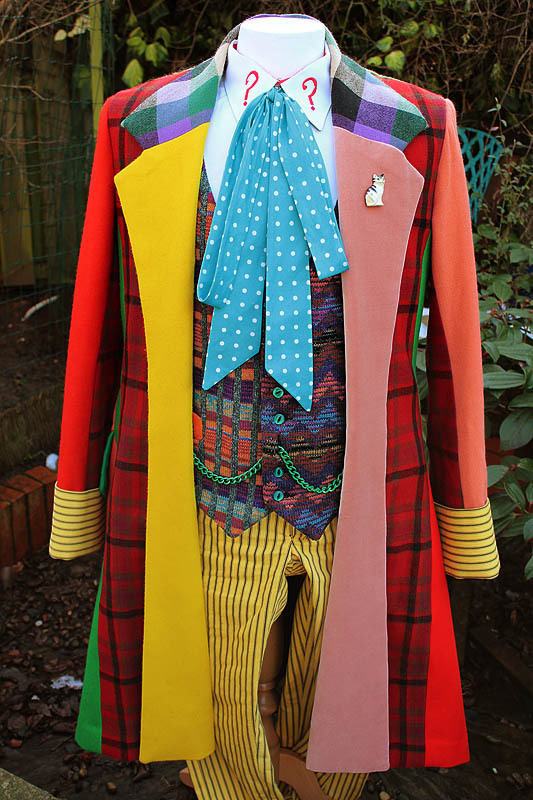 Over on the dw_cosplay forum, one of my readers has posted a very interesting and well researched investigation into the custom worn for the Doctor Who stage play, The Ultimate Adventure. 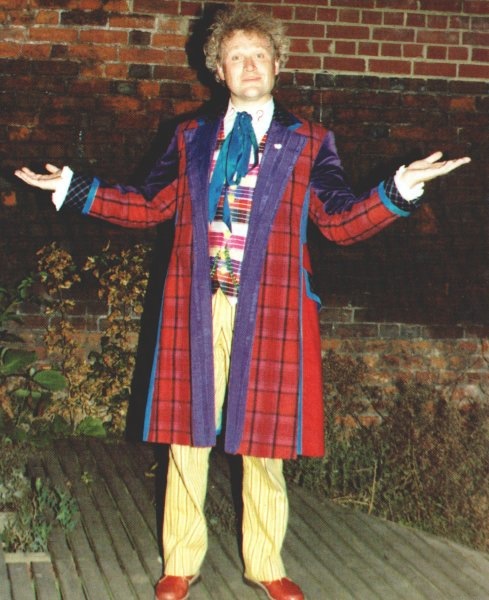 One costume which remains equal parts iconic and obscure is the redesigned stage version of the Sixth Doctor's costume, made for Colin Baker's run in the 1989 stage play Doctor Who: The Ultimate Adventure. Various behind-the-scenes reasons have been given for the redesign of this costume from its original TV version. 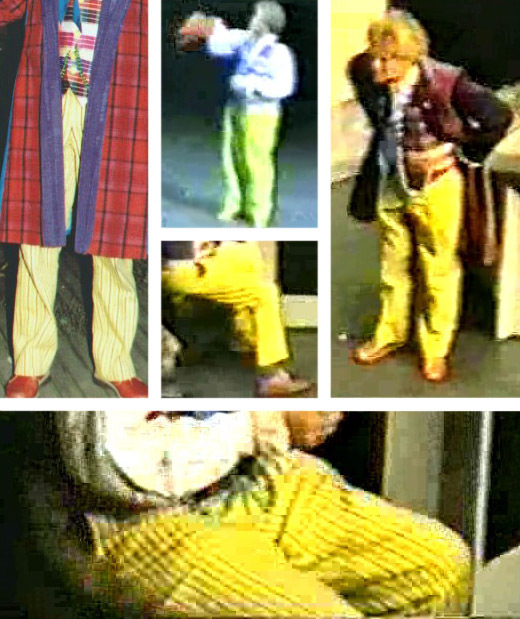 Some sources have suggested reasons of technical suitability for the stage; increased heat from stage-lighting as opposed to a television studio, and the physical action required by the Doctor in a stage production without stunt doubles, meant a more breatheable and freely-moving wardrobe would be required. 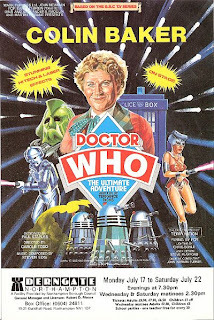 Other sources, including Colin Baker’s website, indicate that Colin himself suggested the aesthetic changes simply because he had never been overly fond of the original, and finally had his chance to improve upon the design. Whatever the reasons, various changes were made to the costume on multiple levels. 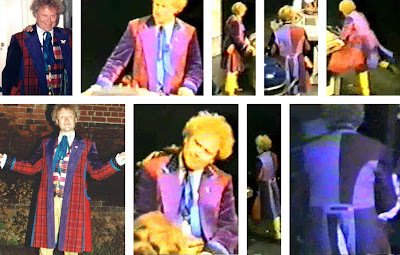 New fabrics were used, notably incorporating purples and blues which would not have been usable on television due to the CSO (blue-screen) effects. Existing patterns were modified, some wardrobe pieces were replaced with entirely different ones, and other tweaks and additions were made. The main problem for costume enthusiasts like us where this costume is concerned is that there seems to be almost no substantial evidence of it in circulation anymore. 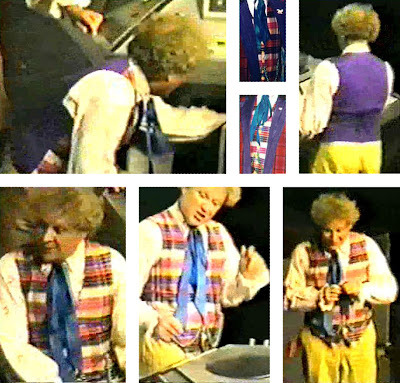 The known set of publicity photos of Colin associated with the play (viewable on Colin’s site) were taken before Colin’s stage costume was ready, so they only show him wearing pieces of his Trial of a Time Lord wardrobe (albeit in a slightly different combination to any worn on-screen.) No official videos or photos seem to have been taken of Colin’s actual stage costume. 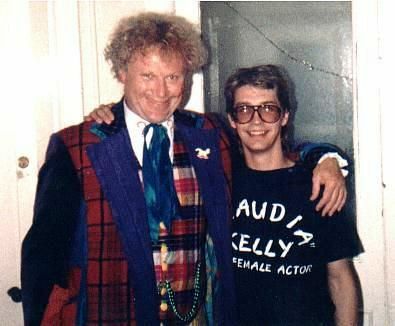 Though the cast regularly posed for photographs with fans after performances, none of those seem to have made it out of scrapbooks and onto the Internet. The snapshot above, scanned in by me from a source I no longer remember (possibly a DWM issue?) and posted to the Internet sometime in the mid-late 1990s, has been the only image circulating online for years. My searches led me to contact Rob Cope, Colin Baker’s webmaster, who just so happens to have worked in theatre and toured with The Ultimate Adventure during Colin’s run. Rob was kind enough to allow me to share this personal photo of him and Colin from that tour in this post, which shows some additional details in the costume not visible from the first photo. To my knowledge, this is the only other extant photograph online showing the costume. Sadly, despite other props and costumes from The Ultimate Adventure finding their way into exhibitions and collections over the years, no clothing items are known to have survived. Rob doesn’t think Colin kept any of the play’s wardrobe himself, and speculates that it may have been sold off to a fancy dress hire shop after Mark Furness, the play’s producer, passed away. I obtained an amateur video of one of Colin’s performances, and have been able to take screenshots. This video was circulating on bootleg tapes in the convention scene throughout the 1990s, and the quality is about what one would expect of an Nth-generation VHS from 22 years ago. The colors are oversaturated due to the combination of colored stage lighting and degraded videotape, and the low resolution obliterates most fine details, but it still shows us a whole lot more than we knew before. This guide assumes Six’s original costume as a starting point, and will focus mainly on the aspects unique to this version. If you haven’t already, please read Bob Mitsch’s original Six Breakdown before this one. The shoes appear to be standard brown or reddish-brown leather derby shoes. They have rounded toes and no toe caps. The laces may be pale brown or beige. The soles are pale around the outer top edge, the bottom layer and heel are dark brown or black. These are standard low-top shoes rather than the ankle-boots of his TV costume. 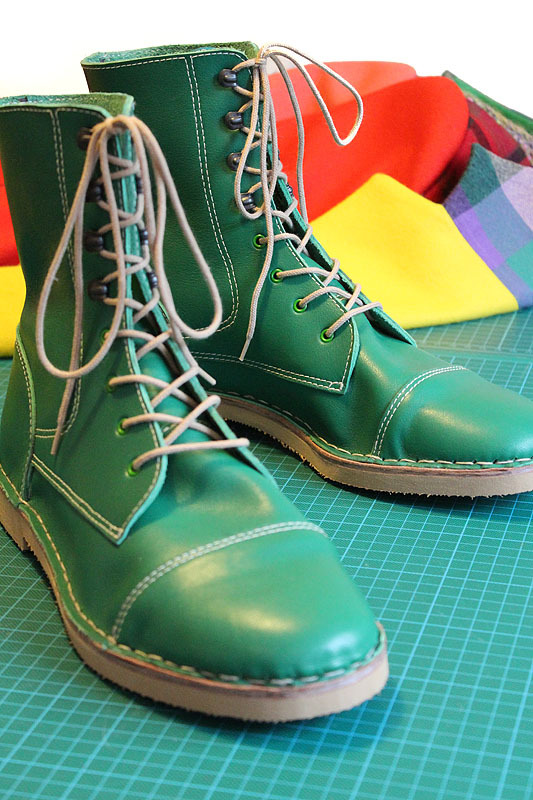 Spats are not worn with these shoes. Colin appears to have dark socks on. The trousers are yellow with black ticking-style pinstripes. It appears that the stripes alternate between thin and thicker stripes; that might also be single and multiple pinstripes resulting in the same general effect in low-resolution. It’s difficult to be sure. 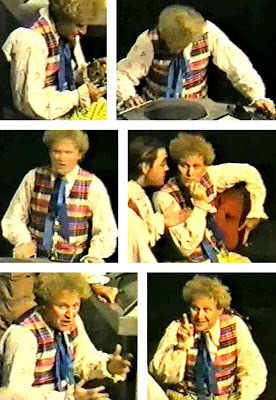 There are standard side pockets, used throughout the play both for storage and for Colin’s famously Doctorish hands-in-pockets pose. I think there may also be slash-style pockets in the rear; I think Colin may have his hands in them in the upper-right photo above. It’s not known if the high-waisted early-20th-century cut of the TV trousers has been replicated here; the waistband remains out of sight beneath the waistcoat. The trousers are certainly of a fuller, roomier cut than the TV ones; even when Colin sits, the fabric is not fully tight on his legs. Braces/suspenders or a belt may be in use, judging solely by the fact that the waistband never dips below the waistcoat. 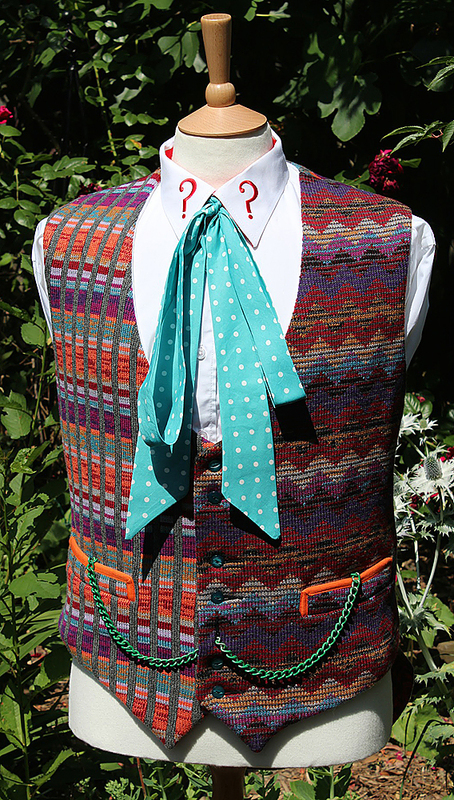 The waistcoat is never opened or removed, so it remains unknown. The biggest stylistic departure from the TV costume is the shirt. The red gingham-patterned placket (the strip around the collar and down the front button strip) of the TV shirt is never visible on this version. The collar still seems basically 1980s contemporary, or possibly a drift back toward the 1970s as the collar points seem to have gotten larger to my eye. They are embellished with question marks as before, though the question marks themselves appear a bit larger as well with wider loops and a curvier shape compared to Six’s TV ones. The most interesting change to this shirt is obviously the sleeves. The Doctor is now wearing voluminous, billowy, pirate-style sleeves which are printed or embroidered with their own pattern of question marks. It’s difficult to be sure with these stills, but the question marks on the sleeves seem similar or identical to the ones on the collar. The sleeves end in snug wrists (buttons or elastic gathers are both possibilities) rimmed with wide frilled cuffs evocative of those worn by Jon Pertwee, who of course played his Doctor in this play during the first part of its run. The shirt sleeves are long enough for the cuff frills to show past the coat cuffs when the coat is worn. 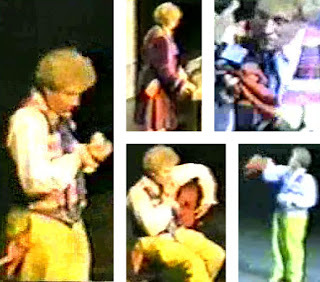 Halfway through the show, the Doctor removes his coat and spends the rest of the show in shirtsleeves. The waistcoat seems to be cut from a contemporary pattern similar to the Trial Of A Time Lord era TV ones, there are no coattails here. The design had been assumed by many to be horizontal stripes based on the first old snapshot, but with Rob Cope’s snapshot and the video it becomes apparent that it's actually a checkered pattern of bold horizontal and subtle vertical stripes. It now seems apparent that the camera flash obviously used on the first snapshot washed out this detail, leading to one possibility that the vertical stripes are of a slightly shinier thread than the horizontal. The snapshots and video suggest the pattern was made of mildly iridescent fabric, such as silk or satin, which therefore reflected the light in various odd ways. Add that to the stage-lighting, and basically the exact colors and check pattern are anyone's guess. My judgment is that they are basically using the color scheme of the rest of the costume; there appears to be grey/silver, pink, yellow, purple, red, and blue on a cream or white background, with the check pattern based on groups of threes. The back of the waistcoat is not visibly patterned; it appears to be plain shiny purple. The rear of the waistcoat is belted with a strip of the same purple material, though the type of closure used on it (tied, buckled, buttoned, velcroed, etc.) remains uncertain. Six buttons are arranged in three groups of two with gaps between, identically to the Trial Of A Time Lord waistcoats. I’m confident that the buttons are in the shape of pineapples, which are still a fairly popular shape for novelty buttons as they were in the 1980s, and ones like these are still readily available in many shops which carry such things. The waistcoat has the two pockets for the watch-chain, as well as the special buttonhole for the chain to pass through between the second and third buttons from the bottom. The chain used is the shiny green metal version used on-screen in Season 22. The chain hangs noticeably lower than the plastic Trial Of A Time Lord ones tended to. See photos in SHIRT and WAISTCOAT sections above. Unlike any of the Sixth Doctor’s other neckties, the fabric used in this cravat seems to be without any polka-dots or other visible patterning. It looks to be just a flat fabric, apparently iridescent, of a medium cyan-blue color. Cut-wise, it seems quite like any of the Trial Of A Time Lord ties in pattern and drape, if perhaps slightly longer to my eye. For the cat badge/brooch on the left lapel you have a distinct advantage over the TV costume, and to understand why you'll need some back-story. During Colin Baker’s original television tenure as the Doctor, fans noticed his Doctor's cat badges and began giving Colin new cat badges as gifts when sending fan mail, meeting him at personal appearances, and so on. Colin eventually amassed a collection of nearly 100 cat badges of various designs. During The Ultimate Adventure Colin decided to finally put his collection to practical use; he wore a different one of his cat badges for every performance of the play. 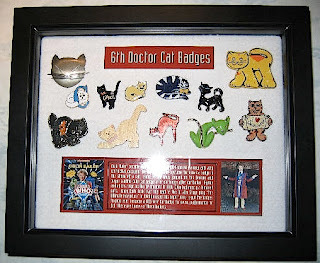 Master Doctor Who collector Richard Briggs, aka RichardWho, has managed to collect 12 of these stage-worn cat badges. He was kind enough to allow me to share his photo of them here. Looking at these you’ve some idea of the wide range of badges Colin used. You can try to find a match to any of these particular cats, or just find any other cat you like which might look at home among them. 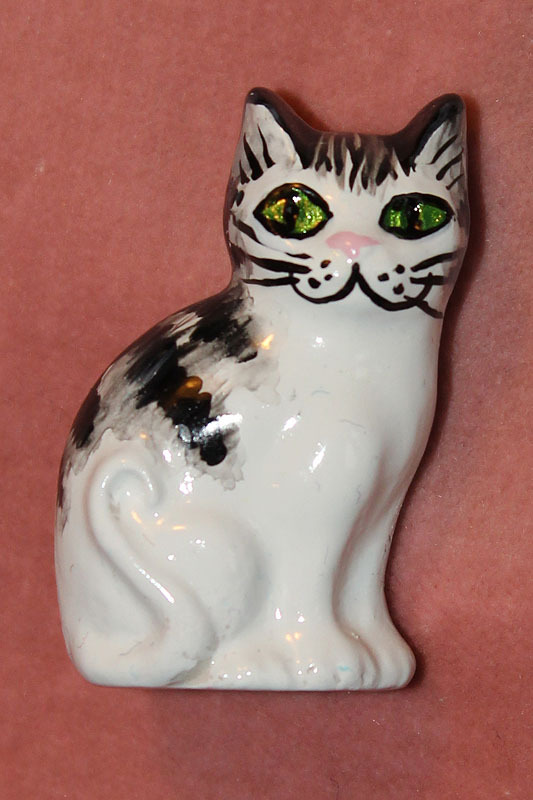 You can pin any cat badge you like to this costume and be canonical as can be. One entirely new addition to Six’s wardrobe is this handkerchief. It’s a voluminous, billowy hanky apparently bright red-orange in colour. It is not visibly patterned. When not in use it can always be seen stuffed into the Doctor’s right coat pocket during the first half of the show, and trailing from his right trouser pocket after he leaves his coat in the TARDIS. The handkerchief is used for one important plot point in the show as the Doctor hides a recording device in it, and is used for other random bits of stage business such as the Doctor mopping his brow or the subservient alien Zog using it to polish random things. 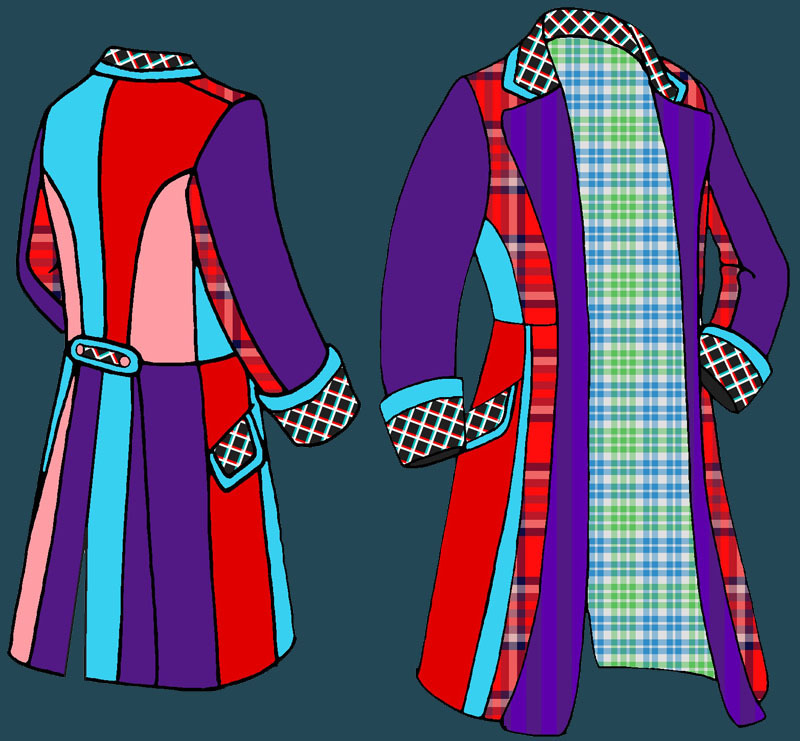 The original coat has been known to drive fans and costumers a bit doolally, but this version might be just a bit easier on the brain. I must point you back toward the original Six breakdown for the basic info, pattern source suggestions, and so on. There was also this excellent guide to the fabric panels on the original coat by corvus1970, who was kind enough to release his artwork freely with blanket permission to tweak. This turned out to be a real timesaver; my illustrations were made with Corvus’ as a base. In addition to the piping which was on the original coat’s pocket flaps, there is now also piping along the outer edge of the collar, on the inner edges of the cuffs, and along the edge of the brace between the two back buttons. The front of the coat and sleeves are symmetrical; no more mismatched left/right sides until you get to the back panels. The outer sleeve panels are made of what appears to be a dark purple velvet-type fabric. The lapels are made of a purple water-marked silk fabric. Where the original coat’s lapels droop down slightly from where they join the collar, creating an obtuse angle along the top, these lapels maintain the straight line across. This also results in a tighter angle for the top lapel points. The pair of braced buttons on the rear of the coat seem pink in some closeups on video. The panel of dark fabric containing a column of applique patches which runs from that brace down the center line of the TV coat's skirt has been left out of this pattern; instead, a simple split runs from the brace down between the rear central panels and separates the two coat-tails. That's about all there is to say at this point about the Ultimate Adventure Six costume. Once again, many thanks to Rob Cope and Richard Briggs for generously sharing their photos and info with us. Different from the tv version, but a "less good" different. Not an improvement, unlike Steve's fabulous purple version. Probably worked on stage, though.